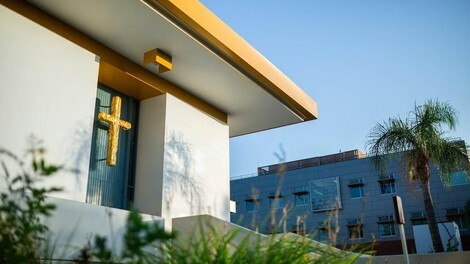 Calvary Chapel is a sacred worship space located on Biola University’s La Mirada campus. 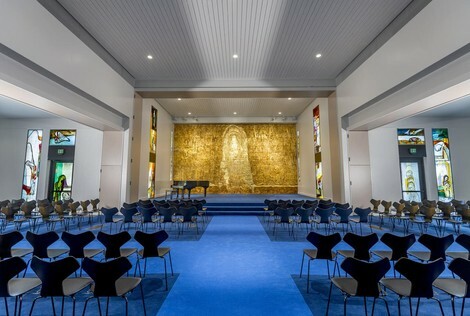 The chapel — originally constructed in 1975 by architect John Andre Gougeon — was renovated in summer 2018 by world-renowned Danish artists Peter Brandes and Maja Lisa Engelhardt, who transformed the space with original sculptures, stained-glass windows and reimagined seating, flooring, paint, and lighting. We invite you to explore their artistic vision with a guided tour of Calvary Chapel, a cross-shaped worship space that has been beautifully recreated around a central theme — the Resurrection of Christ. Click here to view the guided tour videos. On Friday, Sept 7, 2018, Calvary Chapel was officially re-dedicated with a beautiful ceremony. Please click here to view the dedication ceremony.